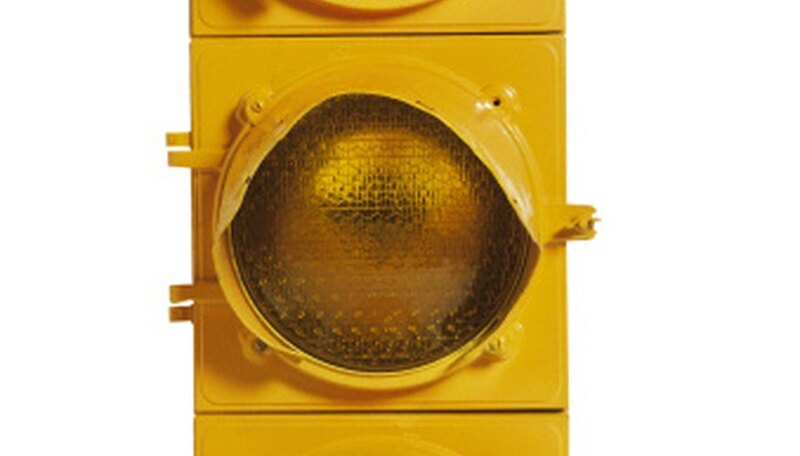 Traffic lights, like stop signs and yield signs, rely on elementary geometric shapes for their signature appearance. When drawing a traffic light, take care to keep the rectangle of the light housing and the circles of the lights symmetrical and even. If these shapes look off-balance or crooked, you will lose the realism in your artwork. Since lights provide a vivid and bright subject, color in each circle with intense hues by applying pressure to your pencil. Draw three squares of equal size stacked vertically on top of each other to form an evenly-segmented rectangle. Draw a large circle inside of each square using your compass. Make each circle equal in size. Draw a semicircle on the top of the rectangle. Make this semicircle arch upwards. Color the top circle red. Use yellow for the middle circle and green for the bottom circle. Color in each circle with smooth, even strokes. Color all remaining portions of the traffic light yellow. Outline each square, circle and the semicircle with the black color pencil. Do not leave any areas of blank space when coloring the traffic light.